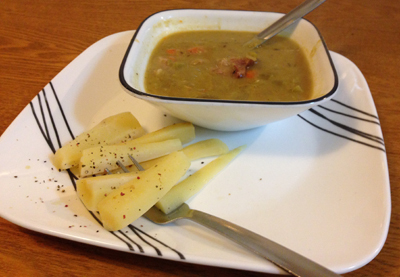 Yay, split pea soup. I had bought a bag of dried split peas & some ham hocks – the weather has been turning colder & thought that this would be a nice hot soup to curl up with on a chilly nite. Ham hocks remind me of growing up – mom or dad used them every once in a while in different kinds of stews & soups. My grandpa was a butcher, so we only had the best pork knuckle – if there is such a thing. I can take just about anything (I’ll gut a kangaroo as needed), but cutting thru all that fat/bone stuff is difficult. Hungry? 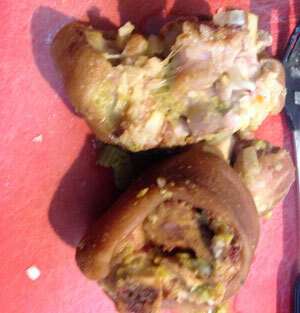 Upside – had a nice consistency & the hocks provided a bit of salt/fat. Sadly, as mentioned, needed tons of salt – if you are on a low sodium or whatnot diet, this would be great. There you go – did kinda like the soup, but was expecting a lot more from the smell. Don’t forget the uber important tags of “pig knuckles” “ham hock” “trotters”. Also, you might not need the salt if you use more robust seasonings or stock. Sliced leeks, spinach, sherry, cayenne, tarragon, MSG.